Dumbbell Push Jerk is an explosive exercise that hits the quadriceps, hamstrings, hips, gluteus muscles and calves. It also engages the upper and lower back, shoulders, traps and forearms. The core section is kept tight throughout the exercise to stabilise the upper body and to support the lower back. Dumbbell Push Jerk is a great exercise to develop power, coordination, balance and stability. Squat down and grab each dumbbell. At the bottom position, the dumbbells must be aligned with your wrist, elbows and shoulders. Your hips should be lower than your knees, keep a flat back position. One end of the dumbbell must on the shoulder while the other must be aligned with your elbow. Keep your elbows high. Straighten your legs and reset your stance to hip width position. Maintain a tight core position throughout the exercise. This is the clean position. Dip your knees and drive your glutes down slightly. Your weight will transfer to your heels. Maintain the straight body position. Drive the dumbbells up by exploding from the hips and full extension at the knees. Your bodyweight will shift from your heels to the toes. At near lockout, push your head between your arms then catch the weight at lockout by dipping your knees. Stand up straight and reset your position. Bring the dumbbells back to your shoulders. Repeat the exercise from the clean position. 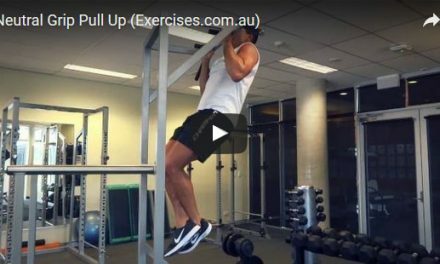 Complete the targeted number of reps or time interval for the exercise. One of the most common faults in Dumbbell Push Jerk is pressing the dumbbells with palms facing out. This will push your shoulder out to the side and take you off balance. From the clean position, leaning too far forward with the elbows positioned low will throw you off balance as you transition to the press.